2012 Camaro V6 asks Mustang: who's the boss? The V6 pony-car battle rages anew, as the hairdressers square off with their shears. (Kidding!) The V6 Camaro gets another power bump, this time a real one. Seems that SAE technicality wasn't enough to put that Mustang issue to bed. 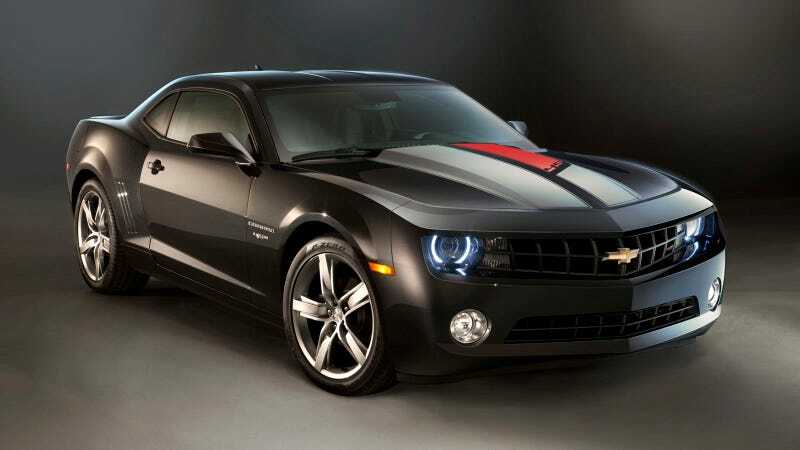 The 2012 V6 Camaro will produce 323 hp by way of a new, lighter-weight version of GM's familiar 3.6-liter direct-injection six, dubbed LFX. Unlike the last paper shuffle, this is a real increase of 11 hp over the 2011 model, which may help the V6 Camaro shave the necessary couple of tenths it needs to claim dominance over the V6 Mustang from 0-to-60. The LFX is also 20.5 pounds lighter than the previous V6. It's one of a number of upgrades affecting most of the Camaro line, some of which will be packaged — along with other visual bits — in the 2012 45th Anniversary Special Edition Camaro. Those include a refined performance suspension package for SS coupes — with a change in geometry, new stabilizer bars (23 mm front; 24 mm rear) and re-adjusted dampers with an eye toward flatter cornering, a more neutral balance during hard cornering, and less understeer — along with several interior changes to the instrument panel, steering wheel and rear camera. There's also a new standard rear spoiler and the RS taillamps will be standard, while the RS package gets a new, body-color "sharkfin" antenna. Boss! Oh, wait.